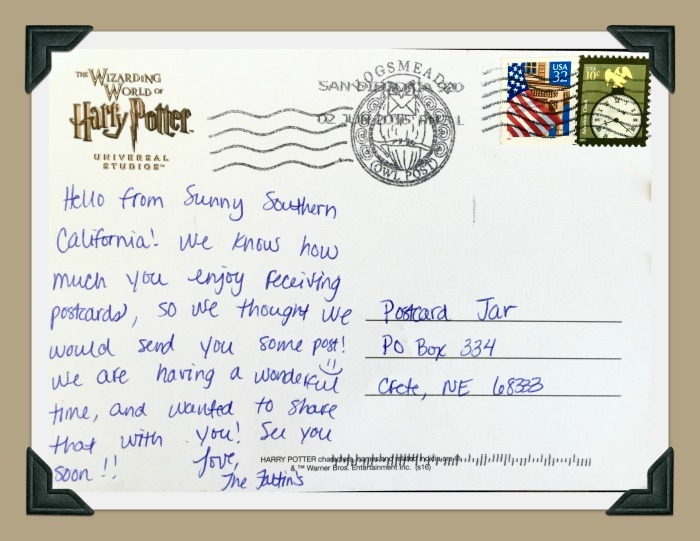 This summer, our friends and neighbors, the Faltins, visited the Wizarding World of Harry Potter at Universal Studios in California and we were so excited to get their postcard! Kevin and Michelle and their two youngest kids flew to California (where Michelle is from) for a wedding, a family reunion, and some good ole fun at Universal Studios in Los Angeles. 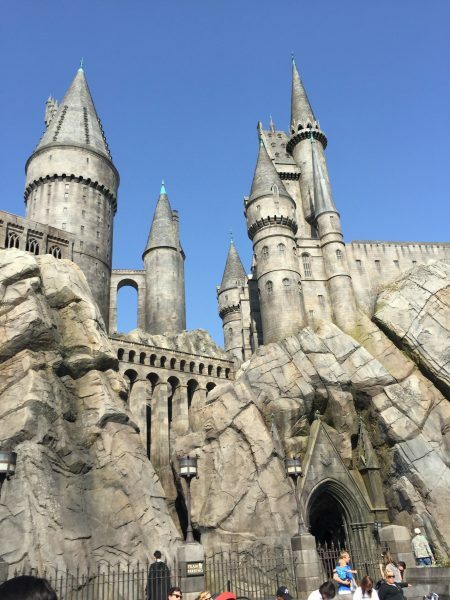 They we especially excited to visit the new Harry Potter attraction, as most of their family has read the books (at least once) and they’ve all seen the movies. They visited Hogwarts, rode the rides, and Owen got his picture with the conductor of the Hogwarts Express. 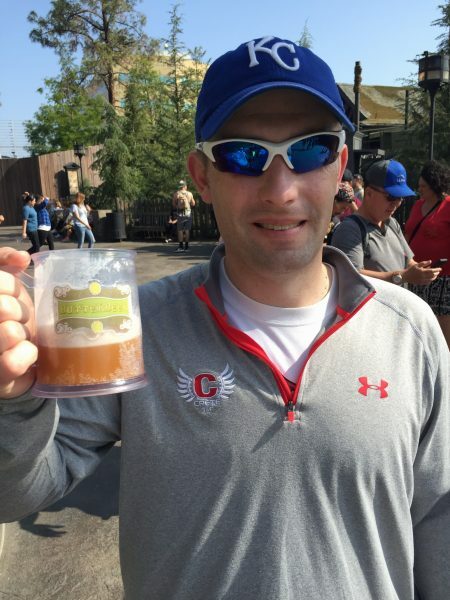 The kids had a great time and dad seemed pretty satisfied in this picture with a nice glass of Butterbeer. Michelle said they had a wonderful day at Universal and Owen especially liked the Jurassic Park ride — evidenced by the fact that he rode it over, and over, and over, and over. Emma loved the Flight of the Hippogriff. The Faltin’s two older children are both teenagers with summer jobs so they stayed at home alone for the first time. When I asked her how that went, she said that they didn’t burn the house down and they were still alive, so it’s all good. 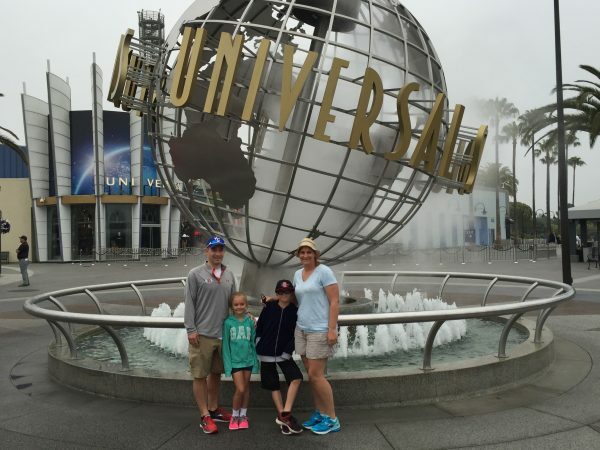 We’re so happy the Faltin family was able to vacation this summer in California. We’ve lived two houses down from the Faltins for almost five years now. They are truly great neighbors and we’re so happy they took the time to send us a postcard.